Gravity can eventually separate a sediment (material that settles to the bottom of a liquid) from a liquid or separate two liquids which do not mix. The heavier element within a container sinks to the bottom, while the lighter element rises to the surface. This process is very slow if left up to nature alone. It can also be wasteful, as evidenced by the way farmers used to separate cream from milk. They would let whole milk stand for several hours until the lighter cream rose to the top. They then skimmed off the cream with a wooden spoon, but as much as 40 percent of the cream was left in the milk. Later, small strainer dishes were used to extract the cream, yet this too was a slow process. The modern centrifuge is descended from a high-speed cream separator that was developed by Carl Gustaf Patrik de Laval in i877. was introduced with the capability for self-skimming and self-emptying. This type of separator can be used for other purposes and can extract impurities from lubricating oils, beer and wine, and other substances. 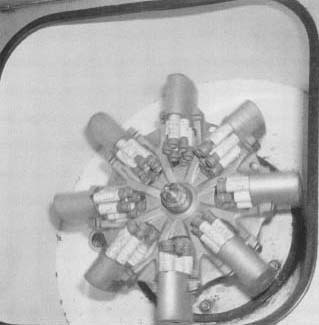 Other types of centrifuges were created in which spin dryers were used for filtering solids. In these dryers, a perforated (full of holes) drum is spun, driving any separated liquids to the outside where they were collected. Spin dryers can now develop accelerations of up to 2,000 times the force of gravity. They are used in the food, chemical, and mineral industries to separate water from all sorts of solids. Other centrifuges remove blood serum (plasma) from the heavier blood cells. Scientists needed faster rotations for separating smaller particles. Particles, like DNA (deoxyribonucleic acid), proteins, and viruses are too small to settle out with normal gravity. The banging of water molecules is enough to keep the particles from separating. The key to separating smaller particles was to build an ultracentrifuge. A centrifuge that could spin fast enough to cause these small particles to settle out. In 1923 the Swedish chemist Theodor Svedberg developed a device that could spin fast enough to create gravity over 100,000 times normal. It could take small samples in glass containers, balance them on a cushion of air, and send jets of compressed air that touched the outer surface. By 1936 Svedberg had produced an ultracentrifuge that spun at 120,000 times per minute and created a centrifugal force equal to 525,000 times that of normal gravity. Newer models can accelerate samples to 2,000,000 times the force of gravity. The ultracentrifuge enabled biologists, biochemists, physicians, and other life scientists to examine viruses, cell nuclei, small parts within cells, and individual protein and nucleic acid molecules. These new tools helped make the genetic engineering field ripe with possibility.